These are ‘Top Trump’ superbikes – the kind of machines you’ll probably only ever see in pictures and rarely in the flesh. 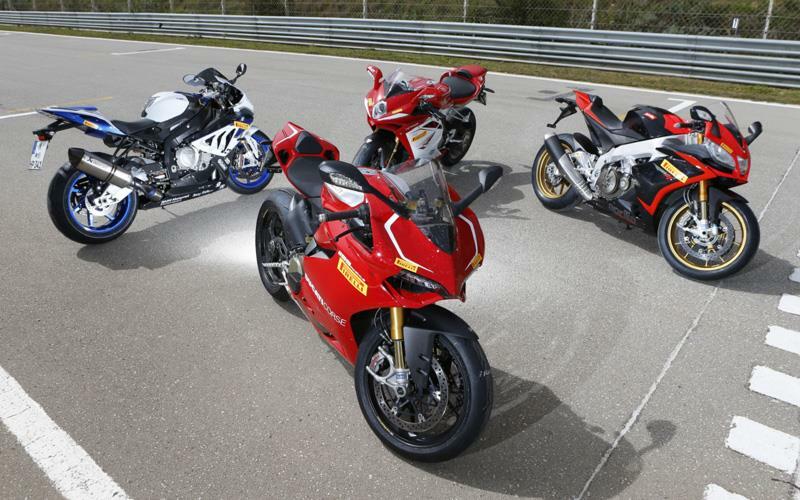 The new Aprilia RSV4 Factory APRC, BMW HP4 Carbon, Ducati 1199R Panigale and MV Agusta F4RR are all about the big numbers: power, capacity, top speed, electronic rider aids and, of course, price. If you’re in the market for an exotic superbike, you’re not going to care what they’re like on the road because you’ll do so few miles. Few owners could ever take them to the limit, either, making a mockery of the thousands of miles test riders have put in to hone these machines to perfection. But who cares? Who’s ever taken their Ferraraghini supercar to the limit and beyond, anyway? This group test is all about celebrating the sheer decadence of these beautiful, mouth-watering machines. We’re not going to judge how comfy they are, what they’re like on fuel or how they fare on the motorway. We’re not even going to judge them on their looks - you can do that by looking at the pictures. Like the ultimate game of Top Trumps, in this test, all we care about is how fast they go around a track, with an ex-world champion aboard. It’s about as far away from the real world as you can get, but we do plenty of that stuff – today is all about having fun and celebrating the most evocative superbikes in the world. So, here we are at the eye-wateringly fast, three-mile Pergusa circuit in Sicily, with an even faster Neil Hodgson. We simply ask him to go as quick as he can on each bike and the one with the best lap time wins – simple. All the bikes come with the latest ‘Version II’ Pirelli Diablo Super Corsas, but we’ve changed them from the standard road (SP) compound, for the stickier SC2 race version, for ultimate grip. Track temperature is 35°C. Using professional 2D datalogging equipment, we’ll record lap times and the maximum speed of each bike at the end of Pergusa’s longest straight. We’ll let you know how each bike’s suspension and electronic riding aids are set up for the laps – it’s a sign of the times that we spent more time fiddling with the buttons on the dash changing electronics, than we did with a screwdriver changing fork and shock settings. We'll be publishing our thoughts on each of the four bikes over the next four days, starting tomorrow with the bike that finished in fourth place.